Lion’s Head Japanese maples are rare and usually difficult to find. Often times carrying a price tag of $350 to $600 or more. I got lucky! Twice. I have a friend that owns a wholesale nursery and a retail garden center and they specialize in a lot of unique and interesting plants. Several years ago, late in the season I stopped by the garden center and put together a small selection of really small Japanese maples. I got one Golden Full Moon, one Goshiki Shidare and a really small Lions Head. I don’t remember exactly what I paid but it wasn’t much, less than $200 for all three of these rare trees. Could have been a lot less than that. Might have been only $125, I really don’t remember. I planted the Lion’s Head right in front of the front porch where we spend a great deal of time during the summer and I just love to admire that small tree. Most of the photos on this page are of that tree in my landscape. I’m not sure what it is that makes looking at this tree so addictive. Even though it is a Japanese maple, most novice gardeners wouldn’t recognize it as such. The leaves are a rich green color. They are not dissected, but instead crinkled. Jagged on the edge, small in size and some of them curl under. My tree has been in the landscape for about 6 years now and it’s still only about 30″ tall, but it has a really nice head on it. But what I find the most interesting is the branching habit. From the porch I can see into the tree and can see the horizontal branches that are slightly twisted. I really can’t find the words to describe this wonderful little tree, all I know is that it memorizes me! Then about a year ago one of my Backyard Growers who is now our “go to person” for rare Japanese Maples had some Shishigashira and I grabbed ten or fifteen of them for the nursery at only $30 each. So both of those deals were really rare finds. Enjoy the photos. I can definitely understand how one could get lost just looking at this amazing little tree! I discovered Lion’s Heads a couple of years ago and fell in love with their rich color and dense leaves, but wasn’t ready to spend the money on one. Well I finally just had to have one and spent close to $100 for one about 4′ tall. We are in Sacramento where the sun and heat can be pretty intense and our soil isn’t the best. Well that wonderful tree has grown about a foot in 2 years! I really scored a couple of months ago and found 3 baby (1′) LH at Orchard Supply that must have been mis-marked for $5! But my real score was just a couple of days ago I found some at Lowes that were marked as just Japanese maple misc variety. They were about 6-7′ and were only $50!!! I snatched up 2 of them and am in heaven! I have a lions mane maple. Can you take cuttings off and get them to grow? Ours is about 15 years old . 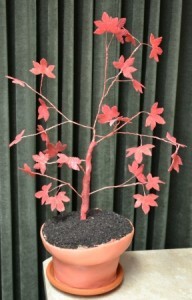 On this site, http://mcgroartyenter.wpengine.com/, we have an article on Japanese maples for warmer climates, just use the search box. But other varieties would be really challenging in Texas. Maybe in the shade???? Thank you Mr. McGroarty for your response to my question on Japanese Maples for the deep South. I appreciate you so much! I’m going to check out that link on Japanese maples for warmer climates you mentioned. Thank you again! I just purchased my first Lions head Japanese maple and I love it. When I first saw it I didn’t know it was a Japanese maple. I have others lace leaf and blood leaf Japanese but this is just unique. It’s about 5ft tall and beautiful I paid $280.00 for it and well worth it! That’s awesome! Truly a unique tree. I have a number of them planted around the nursery. We have two five foot tall Lions head maples. We are not “gardeners” but love the look. This is our second spring with ours, I think based on reading thus far we should have pruned this last fall/winter. This spring we have a fair amount of dead branches and new growth is minimal thus far on both. They are both alive as I see green leaves, but there is a ton of dead ends on the branches probably from winter is my guess. Is it okay to prune the dead end off the branches in the late spring? Daytime temperatures here now are mid to upper 70’s and nights it is around mid 50’s. Prune away, you are not going to hurt them one bit. I recently discovered a fully mature Lionshead Maple at a local nursery.It is 10’ tall and similar circumstance.I was mesmerized buy it.I figured it was to expensive,but I had to ask.It is in a wood planter and they said they would sell it to me for $550.I stopped buy another local nurseriy and inquired about the lionshead.Lucky me the owner was leaving that day for Georgia to purchase stock.He sent me a picture of one he would purchase for me 15 gallon and approximately 6’ tall and similar circumstance.$250.I bought it and couldn’t be happier.I have 5 varieties in my small yard and the lionshead is my prize possession.Can anyone tell me about their other prized trees they would recommend for zone 6.Hot summers and high humidity in my area.I have plenty of shade. That was a great deal! In zone 6 the possibilities are endless and given that you have some shade that is awesome. I need to document the Japanese maples that I have planted around the nursery and post photos of them all.